The Daily Stormer, the white supremacist website that promoted the Charlottesville rally and called 32-year-old rally victim Heather Heyer ‘‘fat’’ and ‘‘childless,” is listed as having two chapters in Massachusetts. 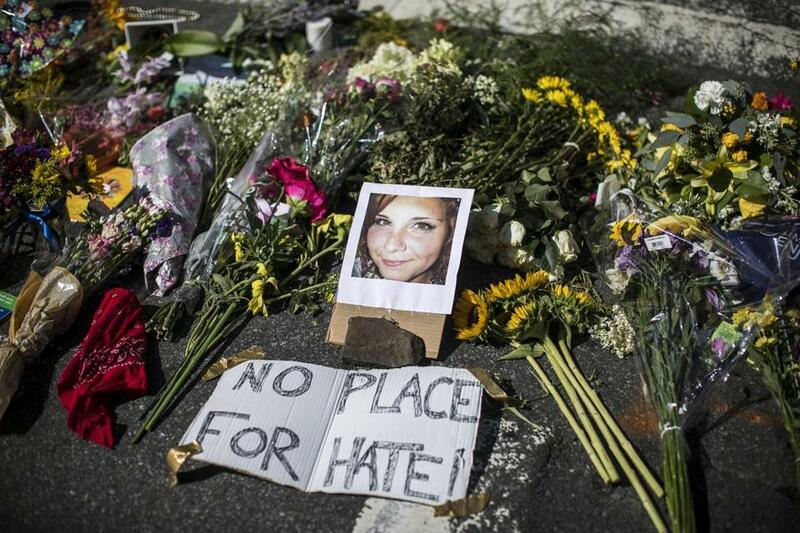 Chanting “blood and soil,” “Jews will not replace us,” and “white lives matter” — organized hate groupsdescended on Charlottesville, Va., last weekend, leading to the deaths of three people and injuries to dozens more. The rally — and President Trump’s responses — rocked the nation. It also raised questions about how prevalent such groups are and whether they’re growing. As Boston girds itself for a planned “Boston Free Speech” rally this weekend, it’s worth taking a look at the hate groups in Massachusetts that have been identified by the Southern Poverty Law Center. There are at least 12 such groups in Massachusetts, according to the nonprofit civil rights group. The groups include the neo-Nazi Gallows Tree Wotansvolk Alliance; the racist skinhead Aryan Strikeforce; the anti-LGBT Mass Resistance and Abiding Truth Ministries; and the anti-Muslim ACT for America. The Daily Stormer, the white supremacist website that promoted the Charlottesville rally and called 32-year-old rally victim Heather Heyer ‘‘fat’’ and ‘‘childless,” is listed as having two chapters in Massachusetts — one in Lowell and one in Cambridge. The map also includes black separatist groups, including Nation of Islam chapters in Boston and Springfield. The group said it compiles its list based on hate group publications and websites, citizen and police reports, news reports, and other sources. The groups have “beliefs or practices that attack or malign an entire class of people, typically for their immutable characteristics,” the SPLC said on its website. The other groups could not be reached for comment or did not return messages seeking comment. In November, Massachusetts Attorney General Maura Healey set up a new hotline for residents to report alleged hate crimes and other “bias-motivated threats.” Since then, the attorney general’s office said Monday, the hotline has received more than 1,000 calls. Of those, 300 were considered substantive reports. The greatest number of calls came from the Greater Boston area, an attorney general’s spokewoman said. The reports “varied widely” and included bullying, threats, vandalism, and harassment, based on religion, race, ethnicity, gender, gender identity, and sexual orientation. None of the reports involved any of the groups listed on SPLC’s “Hate Map,” the attorney general’s office said. According to the SPLC’s “Hate Watch,” which collected more than 1,300 bias reports between November 2016 and February 2017, at least 63 bias incidents were reported in Massachusetts. There’s a difference between bias incidents and hate crimes, Robert Trestan, executive director of the Anti-Defamation League’s Boston office, said Monday. However, Trestan said, the league has also seen the way people have come together in the wake of events like Charlottesville. Trestan also said community leaders must call out and disavow hate groups. According to Trestan, the majority of hate crimes and hate incidents are not committed by organized groups. “It only takes one person that wakes up in the morning” and wants to harm others, he said.